Configuring an RTP Proxy is one of the most confusing topic’s around setting up Kamailio. 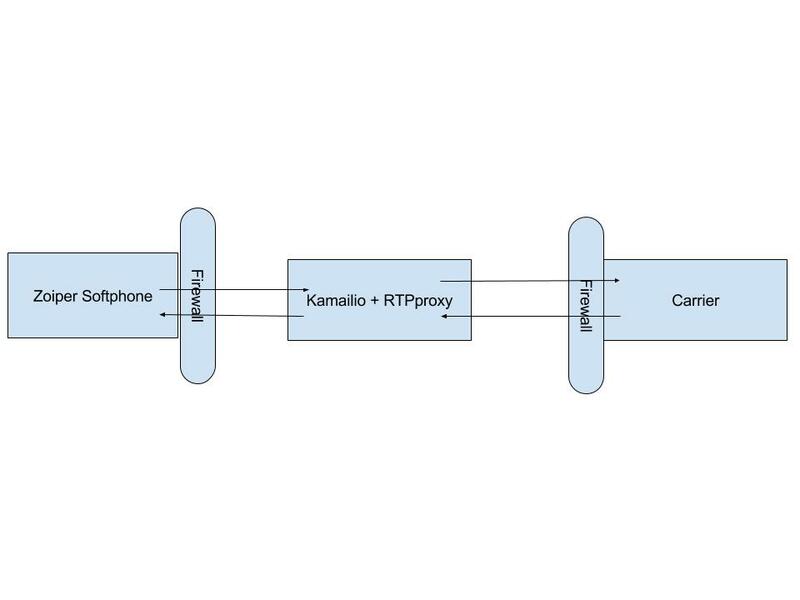 The goal of this article is to help you select the correct RTP Proxy implementation to install, discuss one common use case/pattern that RTP Proxy is used for and then setup up a RTP Proxy implementation to work with Kamailio. Note: We offer paid support for designing, configuring and supporting VoIP infrastructures that contain Kamailio. In this scenario, the User Agent is passing the SIP INVITE thru Kamailio. However, the SDP contains the local ip address of the User Agent because Kamailio is simply doing its job and passing the traffic thru without touching the requests. This means that the carrier can’t send the RTP traffic back to the User Agent because it’s sitting behind a firewall and the internal ip address is being sent in the SDP. Therefore, we need to install and configure a RTP Proxy. In the next section we will select the a RTP Proxy implementation to implement. There are 2 main versions of RTPProxy and it’s very confusing for a newbie to figure out which version you should implement. Since we are not going to implement WebRTC we can use RTPProxy. From here you can either install using yum or from source. We recommend installing from src as there are needed patches in new releases. Change the config file to use the rtpproxy binary. You may need to replace if you installed in custom location. We used Flowroute for our carrier here. other carriers would be similar. If using Flowroute, you will need to login to your Flowroute account and obtain your techprefix. We will assume that you are using the default kamailio.cfg file that ships with Kamailio. You need to restart Kamailio if you make changes to rtpproxy configuration. In our case, we just installed it. So, you need to restart Kamailio in order for it to connect to the RTPProxy. If either service fails to start check your logs while starting the service. Then in your original terminal start the services one by one. You will see errors labeled. One of those will lead to your problem. If you already have a test extension in Kamailio you can skip this section. Now try to register a softphone with the extension you added. Try to make calls using that extension and capture the traffic. We will assume that you have either sngrep or ngrep installed already. Your INVITE and 200 OK messages should be rewritten correctly.